A New Meaning to the Term "Cup Size"
Tonight Jackson was eating some leftover mini corn dogs from our lunch at Pappadeaux. I was sitting a few feet away where I could still see him but be in the living room with Annabeth. She was on the floor on her playmat. Jackson had super human energy - I guess from the ring pop he'd been working on all day - and couldn't stay in his seat. Every couple of minutes he'd come over and ask me for something. 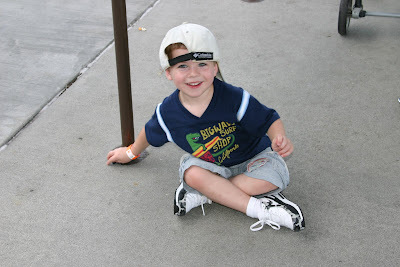 At one point he got close to his sister and said, "Annabeth, I want to give you a corn dog!" I said, "No, baby, Annabeth can't eat food yet. She can only drink milk." I can just see my daughter laying there with a mini corn dog sticking out of her mouth. Jackson got real close to me. "Milk, Mommy?" He peered down my shirt and poked me in the chest. "From that cup?" Our son was just on a roll tonight - Annabeth had her first really good laughing session while we were all sitting together at the table. She was in my lap facing Jackson. Curt told him to make silly faces at her so she would laugh. Sure enough, she thought her brother was hilarious and laughed and laughed. Before we had kids, Curt and I hoped they wouldn't be boring and drag our oh-so-exciting lives down. I'd say they're anything but boring. Yesterday I saw my children's lives flash before my eyes. I had gone to a grocery store by the LPM office so that we could go to lunch with Curtis afterward. However, I neglected to think about the meat, sour cream, and milk in my grocery sacks that wouldn't withstand the heat. I didn't pull into a parking spot when we got to the office since we would just be there a minute. I left the car running in the middle of the lane and just put it in park. I went around to the back to get out the groceries that were in danger of going bad. Curt was going to put them in a refrigerator and then jump in the car with us. 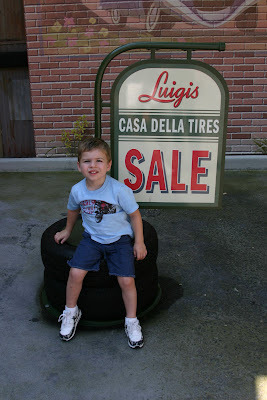 As I was handing them over, I saw Jackson sitting in the driver's seat with his hands on the steering wheel. There are no words. I flew over there and grabbed him out of the car before anything happened. In 20 seconds he had gotten out of his car seat and climbed up there. There are not many disaster scenarios I have not imagined in my mind, but that one beat me to it. I'm not sure how likely it was that he could have gotten his foot on the brake and actually changed gears. But if he had, he would have driven himself and his sister right into someone's back yard or driven backward onto a busy street and then into a ditch. And his seatbelt-less self would have been hit by an airbag. It makes me sick to think about it. Last night Jackson asked about a cross he saw at a nearby church. That got us talking (very simply) about Jesus, God, and heaven. Then we started talking about angels. He asked things like, "Are angels giant, Mommy?" It never occurred to me until just now that my babies were likely protected by them that very morning. I am a thankful mommy. I think we had the best Memorial Day Weekend of all time. For the life of me I can't remember what we did on Friday night. We must have done nothing, which we probably needed. We had a lazy Saturday morning and then Curtis and Jackson took a Man Trip to Bass Pro Shop. Annabeth and I prepared to make a Target run. 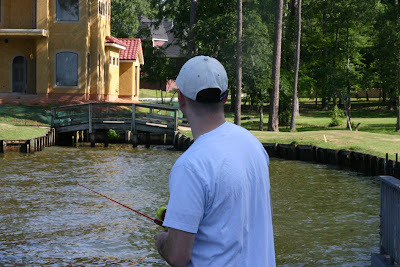 While I was getting ready, we got an invitation via text message to join some friends at Lake Conroe for Memorial Day. Okay, how fast can I type "Yes please!" on my little phone? Woo hoo! I called Curtis right away, told him the news, and asked him to pick up a boat-worthy life jacket - excuse me, a PFD - for the boy. 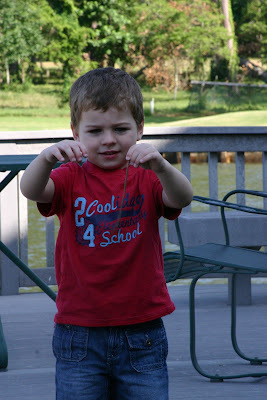 He came back with said PFD, a little kid fishing pole, and some worms. Or "rerms" as we say in the Moore home. After rest time, we went to visit our friends Drew and Kristy and their 3 boys. All the boys swam while Kristy and I stayed dry and talked a million miles an hour. Then we had homemade pizza and cookies and IBC rootbeer. Poor us. Kristy is a great cook and baker and I've now made it my mission never to turn down an invitation to eat at her house. We had the best time. Jackson loves playing with Sage (whom he calls "Stage") and Kolby. When I see him with other boys I feel sad that he doesn't have a brother to romp around with. But when I look down at the sweet baby girl in my arms, I'm so happy I have a daughter. No outing is complete without something strange happening. That night we got mixed up and took one of their cell phones home with us (it's the same one that CJ has). I even called my mom on it and she asked if we had gotten a new number. Uh, no. It didn't register with me until I saw the picture of Sage and Kolby on the wallpaper. Nice move, Brilliance. On Sunday morning we dropped off Beckham with my parents and went to church very early. Curtis and I signed up to help in the preschool ministry once every 6 weeks and that was to be our first day. The kids we were with were about 18 months old. I had kind of forgotten how to relate to them, but it came back. I think I am better with boys at that age, but I enjoyed playing with the girls and wondering what Annabeth will be like when she gets there. They were all so cute. Poor little girls though. They just want to play and climb but their dresses do not help things. Will that keep me from putting my daughter in dresses? Probably not. Then we went to the service, which was wonderful. Our worship peeps sang an acoustic version of "None But Jesus" and it was awesome. 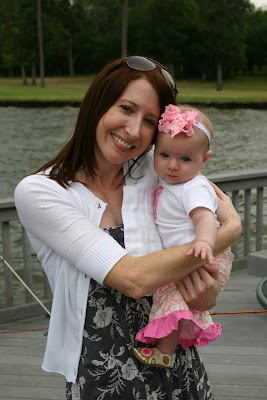 After church we set out for Lake Conroe. There was some traffic on I45 and I realized people were slowing down to look at the Gallery Furniture store that had just suffered a huge fire in its warehouse. You couldn't really see anything from the freeway. Curt and I talked about how successful that business must be that everyone driving by knew about the fire. Mattress Mack has done quite well for himself. We finally arrived at the lakehouse. It was absolutely gorgeous. My heart was doing backflips within me. We hung out for a bit and then took the boat to Five Guys Burgers. Please, let's observe a moment of silence for those burgers. I can't even talk about how good they were because they left me speechless. Then, adding fat to cholesterol, we walked to Marble Slab and partook of even more yumminess. After all, it had started thundering and we needed to let it pass before getting back in the boat. After the kids went to bed that night, we stayed up playing a game called Loaded Questions. It was hilarious and I think I might have to buy it. The next morning we went out on the boat before the masses could get the water all choppy. 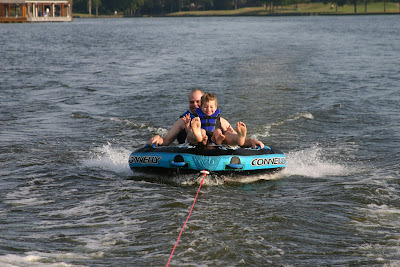 Jackson got to tube for the first time with his daddy. He had a blast. Then Jenn amazed us all with her wakeboarding prowess. After that we had some incredible French toast back at the house that I will be making very soon. We basically spent the day eating, taking turns getting pulled behind the boat, and swimming in the lake in front of the house. There was much happiness and laughter. One thing I will never forget is looking up and seeing my son swinging a golf club around his head, dangerously close to some enormous picture windows that the Jones family cannot afford to replace. Everyone was like, "Oh, he's fine! It's a toy golf club!" 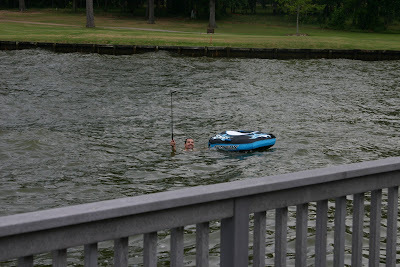 I ran up there and while there were toy golf clubs sitting right there (that looked very real), my son had grabbed the driver that Mr. Erin found in the lake (the house was on a golf course). I nearly had a heart attack. Anyway, who throws a driver in the lake? Well, people like me and that is why I do not ever play golf. Or other frustrating sports like putt putt. At lunchtime, Jenn and Tammie mentored me in the cooking department. I now have mad skills for grilling corn on the cob, making easy peach cobbler, and baking French toast for a large group. I really, really need to spend more time with those girls. We had one final boat ride before it was time to get cleaned up and head home. 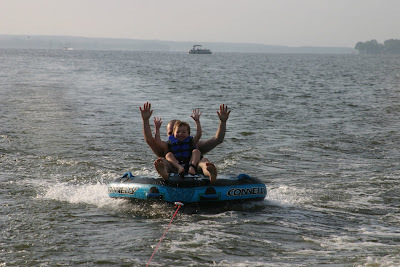 This time I got to tube with Jackson. 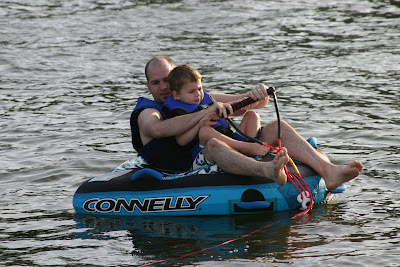 I used to love tubing when I was a kid, so it was a highlight for me. 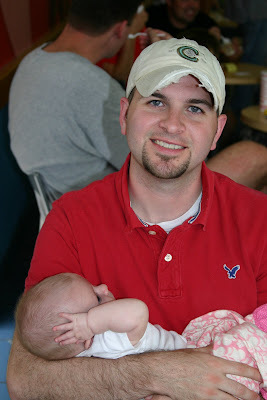 When we got back to the house, Annabeth was uncharacteristically fussy. She was warm, but I thought it was just because it was hot outside. Way to go again, Brilliance! 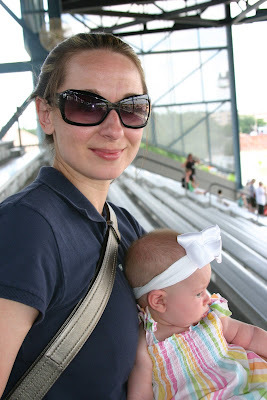 When we went to pick up Beckham, my mom said "Honey, she has a temperature and it's 99-point-something-high." Sure enough, when I got her home and took her temp, she had a 99.7 degree fever. My sweet baby had her first fever! I'm sure she has the cold I had last week and I know how crummy she feels. 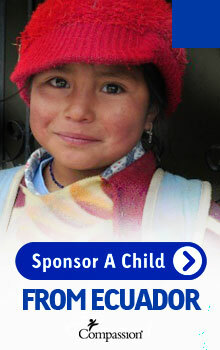 Her little eyes are constantly watering and forming little tears. Bless her heart. Aside from Annabeth's little cold, the weekend was just so much fun. When I was feeling really bad one day last week and both my kids were really needy, I was about to explode. I felt like I had lost all my coping skills and I desperately wanted to get away to somewhere beautiful. (Hello, hormones. I wasn't really missing you.) I knew how ridiculous these feelings were, but I couldn't shake them. In light of how I felt that day, I considered this mini-vacay to Conroe, this wonderful and unexpected blessing, to be a very undeserved gift from my Father. What a great shot in the arm. Thank you Jennifer and family. We are still smiling from all the fun we had! 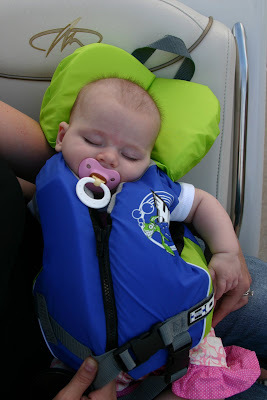 Sabrina, did you ever imagine this outfit you made being accessorized with a PFD? 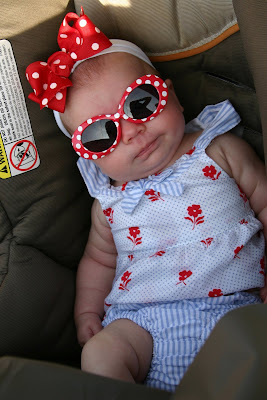 Here's that cute outfit without the lifesaving device attached. So cute! Annabeth loved Miss Kimmie. Bless Clumsy the Worm's heart. It's hard to be at the bottom of the food chain. 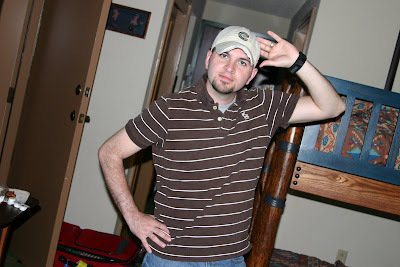 I love this pic of my Hubs. Look what Mr. Erin found! 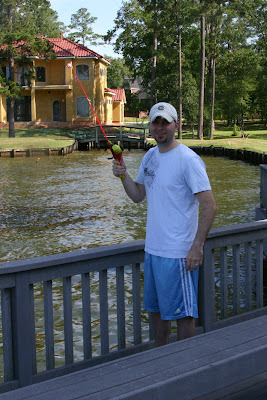 If anyone can look manly with a kids "Cars" fishing pole, it's my husband. 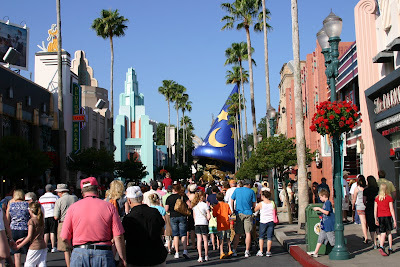 Thursday was our Hollywood Studios day. 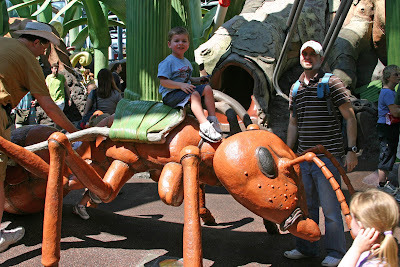 I had been told it wasn't the best park for little kids, but I was really looking forward to taking Jackson to the Honey I Shrunk the Kids playground. We got there around opening time, of course, and happened to see another family from our church. It's a small world, after all! 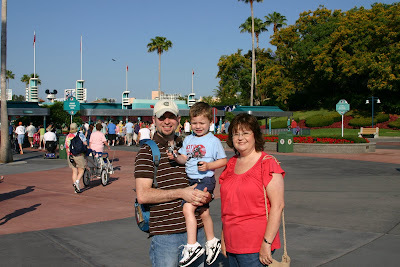 Our plan was to hit the Tower of Terror and the Rock 'N' Roller Coaster first thing. 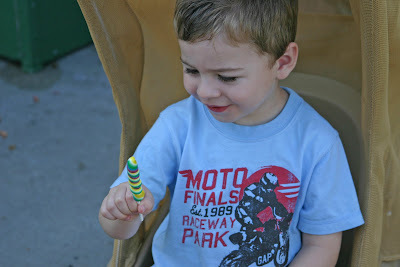 Jackson wouldn't be going on either of those, so I made it my mission to find some awesome candy to keep him occupied. Thank you, God, for the 5 pack of mini-unicorn pops I found at the kiosk in the front of the park. Moms, take note of this. Curtis and Cozy loved the Tower of Terror. 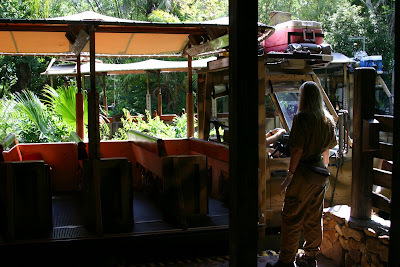 I, however, am not attracted to runaway elevator type rides and was content not to do it. 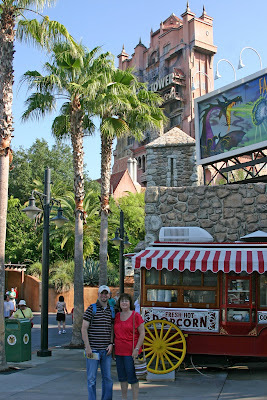 Curtis kept calling this ride "The Hollywood of Terror" and I made sure to make fun of him every time. 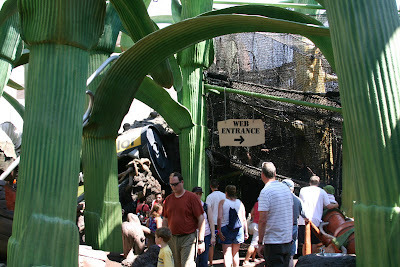 As soon as they were done, Curt and I Walked This Way to Rock 'N' Roller Coaster, which is an indoor Aerosmith-themed ride. I loved it. I was Cryin' when it ended. I was Crazy not to have done it at least one more time. Aerosmith, how I hearted you in my youth. How I was swept away in the moment and wanted to buy a t-shirt, but Hubs said no. I wish I had some pics of that fun ride. 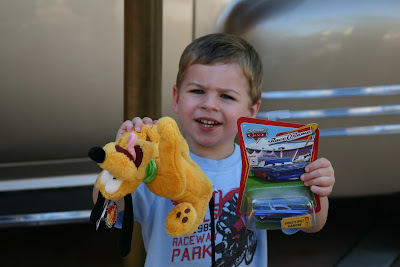 Instead, here's Jackson after we let him pick out a couple souvenirs. This was just a neat car that was outside the shop. At this point I went into a little store that only had fun Disney clothes and accessories for girls. Everything was so adorable. If Annabeth had been a little older, it would have done me in. I ended up getting her an adorable Baby Minnie doll in another store. 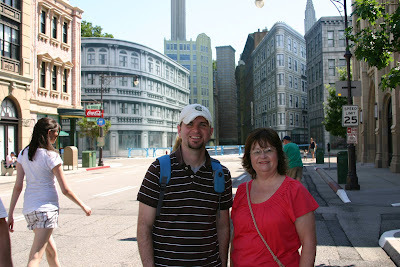 Next we went to do the Star Tours (Star Wars) ride. This was another 40-incher that Jackson barely got on. That was fun and nostalgic for Curtis. They sold little Jedi capes in this park and they were so cute. I wanted one for Jackson but he wouldn't have known what he was wearing. I was obviously getting a little carried away with wanting every souvenir that day, so I kept telling myself that none of this stuff would be as cute or as fun when we got home. The Muppet Vision 3D was next on our list. Bless it's heart. It's so old. It was still fun though. 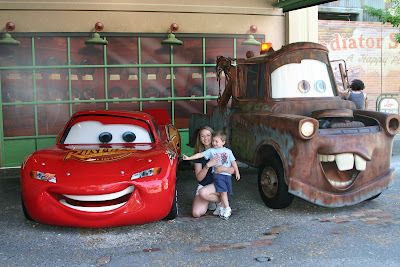 Lightning McQueen and Mater! Oh happy day! They even moved. I loved getting to experience this with Jacks. 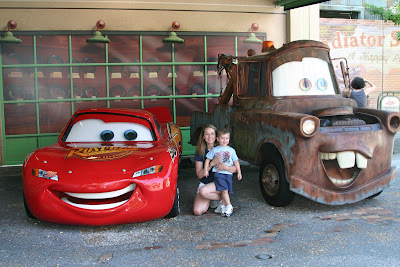 He liked all the characters, but he didn't have a history of loving them like he does with McQueen and Mater. We couldn't leave without getting to touch them. 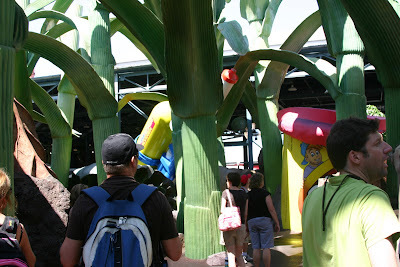 Jackson was a little intimidated by the Honey I Shrunk the Kids playground at first. We took him to climb around in the fake ant hill and he didn't like how dark it was. It took him a minute to shake it off, but then the slide made him happy. I could not wait to get him on this ant. He didn't realize how excited he should have been. The ant was a little hot and burned his legs. 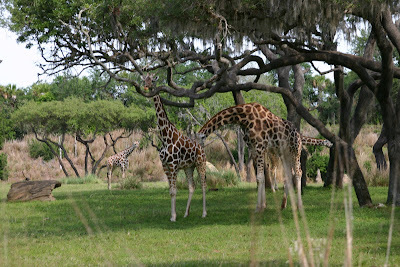 Later when we asked him his favorite part of the day, he said "The playground with the tall grass." I loved the enormous Play-doh containers. 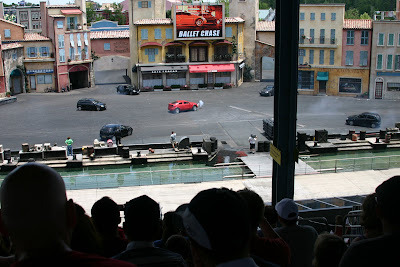 Next we went to the stunt car show. It was very, very hot by then and I was struggling with my attitude. We had to walk a really long way after parking the stroller and then climb a thousand stairs, so it was just a beating to get over there. But it was so worth it and I never thought I'd say that! After the stunt car show, I was on a mission for some popsicles. 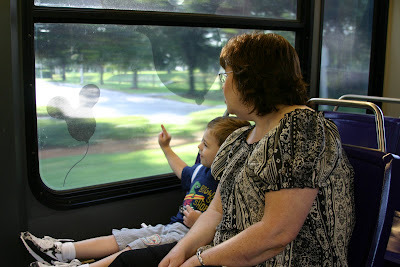 They were just what we needed to make it to the bus stop without losing it. 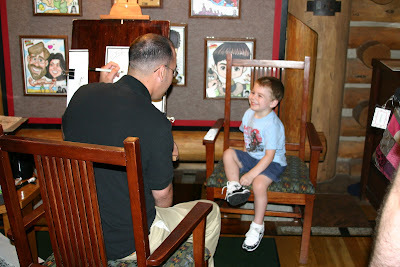 When we got back to the hotel, we had a caricature done of Jackson. Then it was time for some major naps. By dinnertime we had gotten a little tired of the hamburger/fries/nuggets/pizza meals we'd been having. We'd noticed a restaurant in our hotel called Artist Point. In culinary desperation, Curt called the restaurant and managed to get us a dinner reservation. They made sure to tell him that he needed to wear a collared shirt. So this was obviously going to be a nice place. With steaks. And wine glasses on the table. Pappadeaux for lunch after church was the height of my son's restaurant experience. 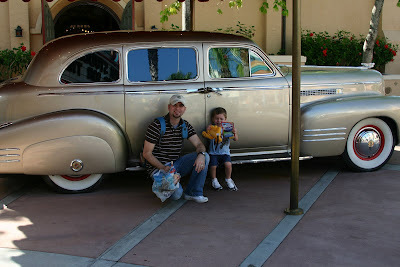 But since we were at Disney, this restaurant was cool with us bringing our kids. Awesome. 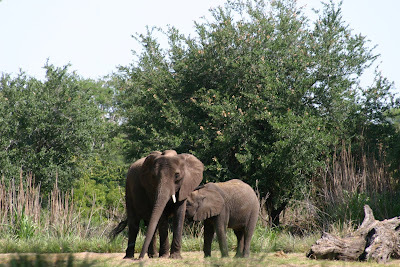 They were so kind when we got there. The servers and hostesses talked to Jackson and gave him stickers. One by one they came over to compliment us on our darling baby. Our waitress aimed to keep our boy happy, so she brought him more apple juice every time he emptied his cup. Jackson had been saying his stomach hurt that evening. We didn't think much of it. In other words, we were in denial. Then he expressed no interest in eating. I really wanted him to eat though because all day long he'd only eaten junk. We were on vacation and I didn't feel like fighting with him at meal times, so he had gotten away with a lot. I hadn't really thought about it, but he'd only eaten candy, dessert, and a few fries the whole day. During dinner I gave Jackson a small bite of my steak. When he gagged on it I wasn't real surprised because sometimes he has texture issues with beef. My mother-in-law's vomit radar was going off, but I sat in ignorance. Then - oh Lord help us - we saw the vomit face. Curt plucked him out of his chair faster than you could blink an eye and they disappeared. 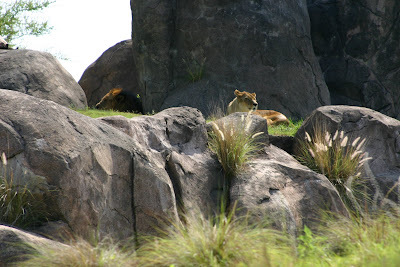 They had gone around a corner and we couldn't see what was happening. I was sad for my boy that he had probably thrown up. I assumed they had made it to the bathroom. It was time to pay for the meal and I didn't have our meal card to pay, so I went to hunt down my boys. Puke. Puke covering the floor next to the hostess stand. Puke that a woman was wiping off her feet. My mind couldn't let myself believe it. Is that MY son's puke? Oh, yes. Yes it was. And for the next 20 minutes, everyone who came and went from the restaurant had to step over it. My mind was spinning. Half of me felt so bad for Jackson. The other half felt so bad for myself. I was embarrassed. And afraid we were all about to come down with a stomach virus and ruin our vacation. Thankfully, it remained an isolated incident. Jackson was asking for food as soon as he got cleaned up and wanted to go swimming. Yeah right. We're not having any puke in the pool this year! Everything was fine - until we had another interesting restaurant incident the next night. I'm sure you can't wait to hear it. I know you want to share an embarrassing restaurant story. Spill the beans! 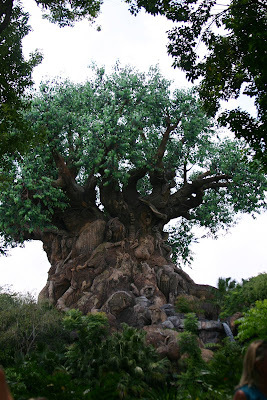 Our day at Animal Kingdom was one of our best. None of us had ever been to this park before and I suppose that added to our fun. We arrived by bus just in time for the welcome ceremony. You can see the mass of people walking in slowly. 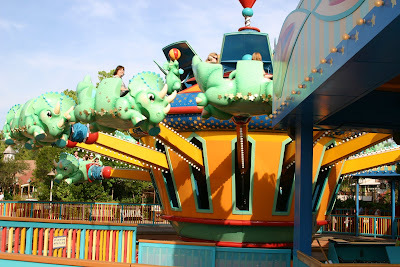 Then we quickly made our way to Dinoland, USA, where Cozy and I both rode the Triceratop Spin with Jackson. There was a really cool roller coaster right by it called Primeval Whirl that I would have loved to have ridden, but Jackson wasn't tall enough. 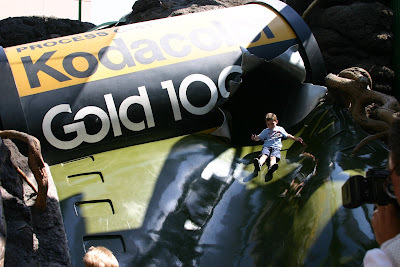 He nearly had a meltdown when I told him he couldn't ride it, so I figured it would be mean of me to do it myself. Oh well, maybe next time! Here's my sweet girl - always along for the ride! I think I've failed to mention until now that I had been praying for weeks before our trip that Jackson would reach 40 inches in height. I actually didn't know how tall he was but I figured he was pretty close. At 40 inches a whole new world of rides opens up to you. It wouldn't have been the end of the world if he didn't make it, but it would have added to our fun. So a week before our trip, Curt measured our boy. He was 39 inches flat footed. So close! When we measured him in shoes he was 39.5 inches. Now that was so close it was almost heartbreaking. We resolved to try to get Jackson to 40 inches. So Curt went out and found some really humongous tennis shoes that he thought were cool and I thought were hideous. (We never agree on shoes.) He bought some heel inserts to go in them. That put him right under our goal. Then my Dad came though big time by making another heel insert with some cardboard. That did it. Forty inches he was! And let me tell you, he rode all those rides with gusto! 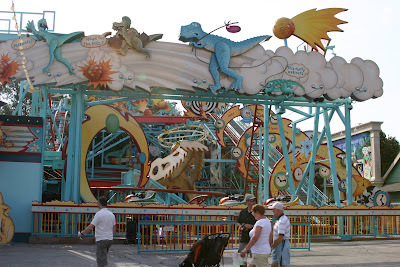 The one time we regretted taking advantage of this contrived height was when we road a ride called Dinosaur. 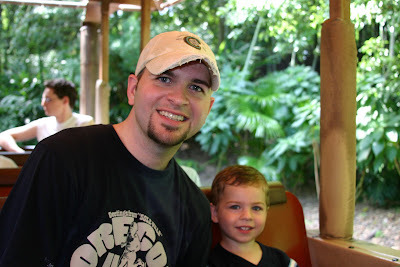 Jackson is totally into dinosaurs and we really wanted him to see the animatronic dinosaurs on this ride. Looking back, we definitely should have ridden it first before taking him. Y'all, it was hands down the scariest ride I've ever been on in my life. It starts out okay but halfway through it gets very intense and loud. For the first half, you should have heard how obnoxious Curt and I were when we would point out a dino and celebrate it wildly and happily as we tried to keep our guy from being scared by how real it all looked. Halfway through, I knew there was no salvaging it. I just covered my baby's eyes until it was all over. Curtis is so great with Jackson. He kept telling him afterward how brave he was. For the next few days he kept saying, "I'm brave! I'm very brave!" That night I told Curt how awful I felt and that we should start saving for his therapy. Curt said, "Amanda, he probably doesn't even remember it. All he knows is that he's brave." 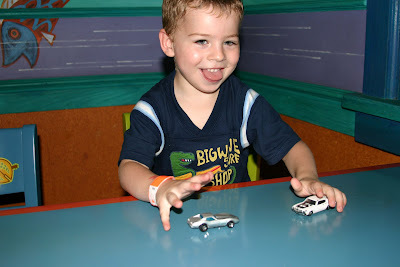 The next day Jackson said, "Daddy, there are no more monsters because I'm brave!" How much do I love that kid? 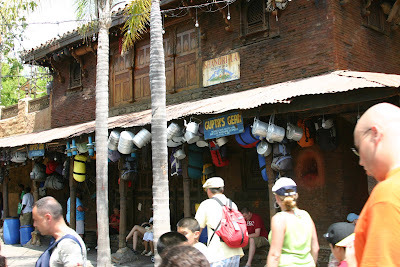 After Dinosaur, Curt, Jackson and I went on the Kali River Rapids. It was one of my favorite rides of the day, but I left my camera behind so it wouldn't get ruined. We had a ride like this at Astroworld called Thunder River when I was growing up. I specifically remember going on it with my Memaw. Basically, you get in a big floating tube with a bunch of other people and you go through a river and get very wet. Curt let me wear his hat to protect my hair. We had so much fun. When we got splashed really big at the end, Jackson's eyes got really big and he looked like he was going to spaz out about being soaked. We had a two-second window to convince him that getting wet was awesome, so Curt yelled, "Yeah! We're all wet!" Then his face lit up and Jackson said, "Yeah! I'm all wet!" Way to go, Hubs. 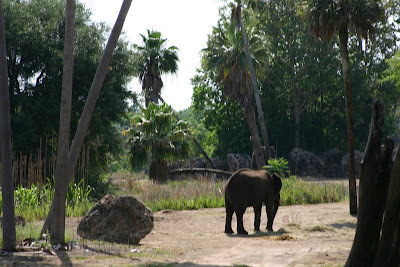 Next we did the Kilimanjaro Safari. Here's Jackson waiting to go next. You can see how wet he got. This was a great experience. I'll let the pictures do the talking. 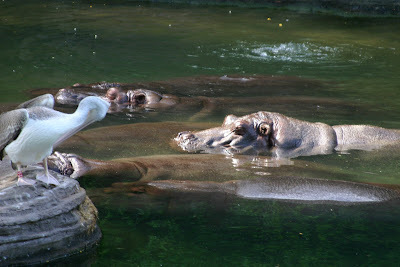 I'm not sure if the disturbance in the water was some hippo gas or if it was the pond's aeration system. 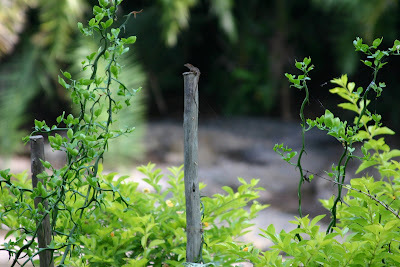 I was trying to photograph a bunch of lazy alligators, but my camera focused on that little lizard instead. I never even saw that thing until I uploaded the pictures on my computer. 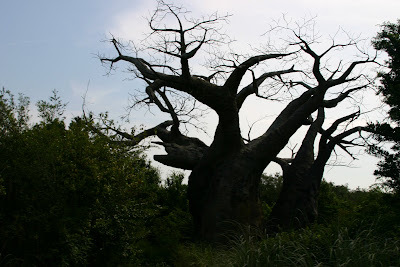 I remember seeing a picture of a tree like this from my parents' Africa pictures a couple years ago. Sorry, UT peeps. 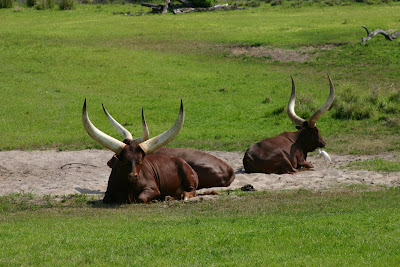 These guys pretty much put Bevo to shame. They were enormous! 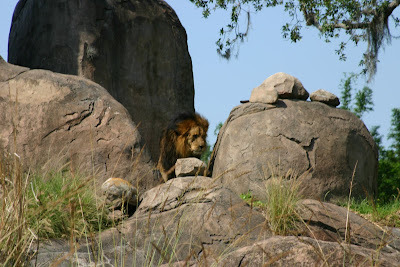 This guy came out from between the rocks right as we drove by. It was awesome! Here he is with his woman. 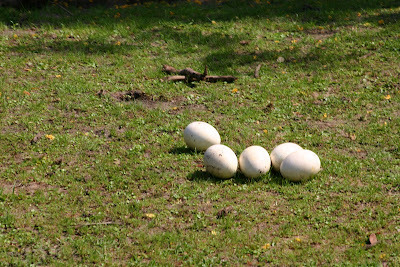 Here are some ostrich eggs that we all thought were probably fake. 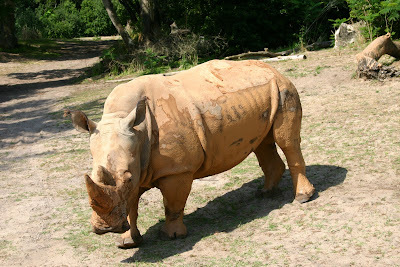 After the safari, I had to go feed Annabeth. The baby care facility in this park was amazing. I even had a private nursing room there. Not to be gross, but Annabeth hadn't pooped in 3 days and I was on high alert for a blow out. Nothing yet. 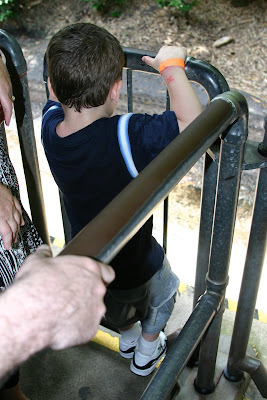 While I was there, Jackson got to play in The Boneyard (dinosaur playground) with Daddy and Nana. 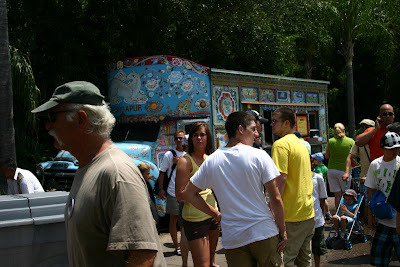 Then we had some really great pizza at the Pizzafari. After lunch, Annabeth's little bowels woke up from their long nap and we narrowly missed a blow out. It was back to the baby care center for me! 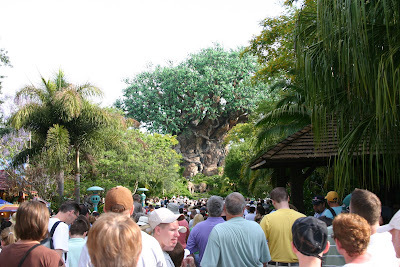 Here's the back side of the Tree of Life. This is when we also saw a modelesque woman covered in green vines who hangs out in the trees. A little weird. 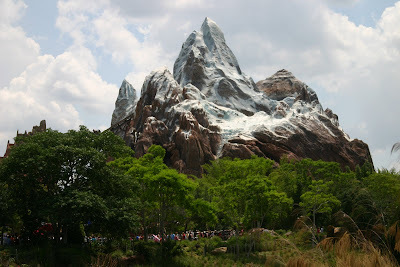 Next stop, Expedition Everest! 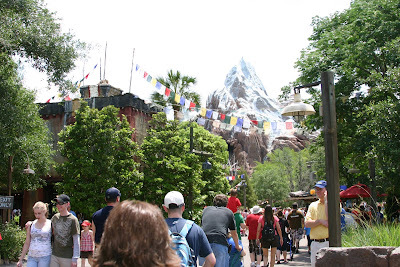 That mountain housed an awesome roller coaster. I was so much fun. We three adults took turns going on it. 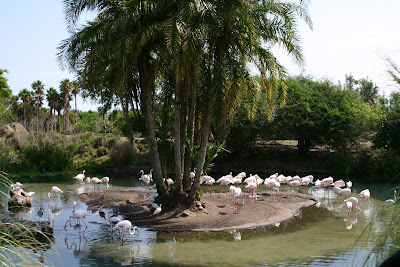 The scenery and atmosphere in this park were absolutely amazing. I felt like I had visited several different countries in one day. That truck was a snack shack. By this time we were very hot and getting a bit cranky. Orlando was having record highs and we were in the mid to upper 90's. This is not unusual for a Houstonian to experience, except I would never choose to be outside in it for hours on end unless I was swimming. 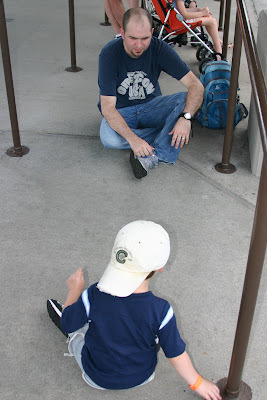 Anyway, here's Curtis trying to entertain Jackson with his race cars while we waited for the bus to pick us up. I have no idea why I took this. After we rested back at the hotel, we went to the pool. One thing I remember about the pool was that a little boy - probably 5 years old - started talking to me and telling me all kinds of stories while I was watching Jackson from the side of the baby pool. When Jackson realized that another kid was taking up my attention, he was bent on getting it back. Then he looked at me with this priceless expression - like he loved me so much. It was a very sweet moment between us, right there in the urine-filled baby pool. This was a wonderful day. It either tied or came in slightly under Magic Kingdom. 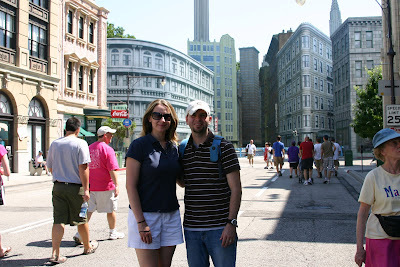 Next park: Hollywood (MGM) Studios!